Diane and I are very excited to announce that with the help of Bro. Mike Markham (Alabama Area Coordinator) and the ASR Board of Directors, we’ve been able to secure Evangelist George Hurt to speak and teach at our 2019 Bind the Strong Man event in Myrtle Beach on Friday night, March 1, 2019 from 8:00 PM until Saturday March 2, 2019 at 7:00 AM. This is the first time ASR has brought in a special teacher for BTSM. During our 2018 National Rally, we discussed with several members about having a strong prayer warrior “teach” us more about the most powerful weapon in our Christian arsenal to fight the enemy, prayer! Bro. Hurt has been used across the globe to help spread the Oneness Apostolic Message and testimonies always follow about his “anointed ministry” and how “lives were positively impacted.” Within our own ASR ranks, we’ve seen God work a miracle through Bro. Hurt. After 5½ years of not walking following a motorcycle accident, Sis. Renaye Thompson (Hocking Hills OH Chapter) was prayed for by Bro. Hurt and she started walking that day! The public is invited and each of you is encouraged to attend! The event will be especially helpful to our ASR Chaplains! BTSM events set the stage for the annual riding season and have often been termed, “life changing!” We need to know more about prayer and how to become a true Prayer Warrior if we expect to see changes in our lives and the lives of those for whom we pray! We will be calling on each of you to participate in a water-only fast in early February to set the Spiritual Foundation for BTSM. The personal and collective benefits are enormous! Get you mind around a 1-day, 3-day, 5-day or even a 10-day water-only fast and let’s make BTSM 2019 the kickoff for God opening doors in our lives! Although BTSM is a “nationally sanctioned” ASR event, it is still fully funded by the local chapter of ASR and/or the local church. For this reason and due to the anticipated expenses, we’re asking any ASR member and/or ASR supporter to please donate to help. 100% of the funds will be used for direct expenses for the event to include, airfare, meals and an honorarium for Bro. Hurt, plus snacks for the all-night event and breakfast Saturday morning. Several of the Board members have offered to assist and we are on our way to making this event a reality! If funds are received above the expenses incurred, the excess funds will go to Motorcycles for Missionaries. Any donation amount is acceptable! Please prayerfully consider contributing. The best way to donate is to mail a check to me that’s made out to CLC of Myrtle Beach. Mark on the check for 2019 BTSM. PLEASE RESPOND PROMPTLY SO WE CAN GET FUNDING OUT OF THE WAY AND CONCENTRATE ON PLANNING! In response to an email received on July 22, 2015, I attempted to answer this underlying question received with the subject title “Just Want To Know.” I have modified the email below to only correct punctuation, spelling and grammar and to hide the identity of the individual who sent it. My response is nearly verbatim as to what I sent to him. As of this writing, I have not heard back. From what you say, and assuming you are a faithful member of your church, you are definitely a candidate for membership in Azusa StreetRiders. All that would be required is the application completion and approval of your pastor. But, as you say, your pastor never responded to your inquiry about joining us. Please don’t be offended, but could it be, that you are not a “faithful” member of the church? Over the years, we have had many, what I call, “rogue” Apostolic bikers try to join us. Some were successful, but most were not because of the insistence on a pastor’s approval to join ASR. By “rogue,” I’m simply referring to someone who has issues with authority and submission, both of which are solid Biblical principles. If someone cannot be faithful to a pastor and his church, can they truly be faithful to the kingdom of God? As for your pastor, I do pray every day for pastors around the world who preach God’s saving Acts 2:38 message. Hopefully he is in “right standing” with the Lord! I believe that many believing Christians, even many Apostolic pastors, will be surprised on Judgment Day just as they were in Matthew 7:21-23. Not knowing him, we will pray for him and other pastors, that God would give them clear direction in these end times! Hanging out in the bars and at the 1%ers’ parties, to us, runs contrary to the two scriptures cited above. Saying that, we try very hard to interact with 1%ers and others who are lost at any opportunity made available to us. We are a ministry, not a club. We try to avoid the club mentality. Yet, we do things that would surprise many Apostolics. For example, in my hometown of Myrtle Beach, SC, we have cosponsored a couple of events with the Hells Angels. This opened the door for me to teach a Bible study to the local chapter president and for several years, we were able to take his two boys to our church for Sunday school. Although not in church, he is a good friend today. By using this approach, I have been told by 1%ers on several occasions and have had other club members tell me that there is a different, higher level of respect given to Azusa StreetRiders because we are not perceived as a “sitting on the fence” ministry. Other ASR members have had similar statements made to them for approaching outreach in this manner. If after reading this you have more questions about Azusa StreetRiders, please let me know and I will try to respond or have a conversation with you at any available time. If you desire to join us based on our outreach model cited above, I suggest you fast and pray about it and if God directs you, download our application, fill it out completely, take it to your pastor and have a serious conversation with him about your walk with God, have him sign it, and mail it to us. We will welcome you with open arms and put you to work with Azusa StreetRiders for His Kingdom! To every thing there is a season, and a time to every purpose under the heaven. Ecclesiastes 3:1 says it so well. My season as President of Azusa StreetRiders is about to end. My wife, Diane, and I have been actively involved since the formation of this ministry in 1999 and its time for new leadership! We have been blessed to use “God’s motorcycle” (everything belongs to Him) to help evangelize the biking world and have seen growth of ASR from inception as a local church outreach using motorcycles, to now having 27 chapters (23 in US, 1 in Canada, 1 in Philippines, 2 in India) with members covering 34 US States and 3 Canadian Provinces. Additionally, Azusa StreetRiders have provided funds to global missionaries in 11 countries enabling them to purchase approximately 25 motorcycles…motorcycles that are used to spread the Oneness Apostolic, Acts 2:38 message of salvation on their fields of burden! When we first started, nearly 700 Trinitarian motorcycle ministries/clubs were identified and ASR was the only Oneness Apostolic ministry to be found. Today, the same is still true! Through prayer, God has opened doors and potential splintering of this ministry has not occurred. We are still the only Oneness Apostolic motorcycle ministry in the world! God is Good! As an organization, faithful Azusa StreetRiders have forged relationships with Christian motorcycle ministries, secular motorcycle clubs/members and outlaw motorcycle clubs/members. We’ve won some and planted seeds with others. We’ve professed our Oneness Apostolic heritage and beliefs and are now seeing new friendships formed that will, in Jesus’ name, result in acceptance of God’s only salvation plan. 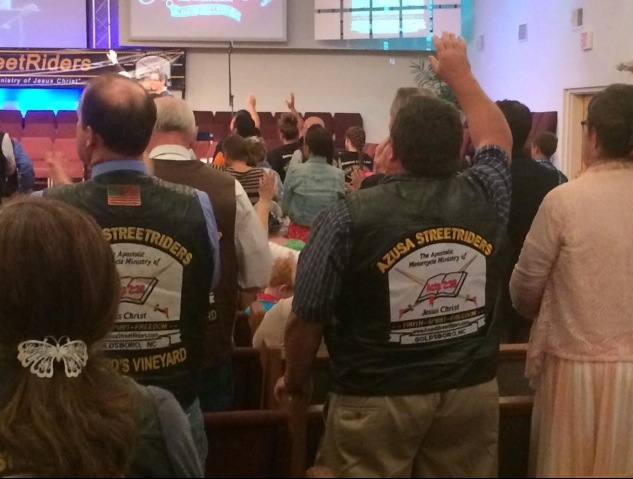 We’ve also seen recognition of a motorcycle ministry as truly having merit within the Oneness Apostolic community. At our Azusa StreetRiders International Rallies, we’ve been blessed to have some of the top leaders and theologians in our movement as guest speakers; Paul Mooney, Garland Hansom, Jonathan Sanders, and Cortt Chavis. And this year, David Bernard will be our guest speaker! Our growth and acceptance has occurred due to much prayer and the dedication of our truly amazing members. Nobody has ever taken a penny for anything they do concerning this ministry. Even travel, food and lodging for every event attended, is a non-reimbursable personal expense! All donations go to missionaries and we are supported solely by membership dues and product sales. Diane and I believe our organizational “purpose” (Ecc. 3:1) has been fulfilled and that for Azusa StreetRiders to get to the next level, we must step aside and let those with new ideas direct the future of ASR. That doesn’t mean we won’t be attending every event possible, only that we’ll be doing so as “members” not “leadership.” We have faith that God will guide and lead those who are voted into position at our Annual Business Meeting at the end of our ASR National Rally in Maryville, TN on August 1st. Please jump in and fully support the new leadership. Help them grow this ministry into all states, provinces and countries, anywhere you find motorcycles moving lost souls about their daily lives. Thank you Jesus and thank you to all our friends. Words cannot express our heartfelt love for each of you. LH&R (Love, Honor & Respect)! Rest assured that you will continue to be in our prayers. This has truly been an amazing journey! 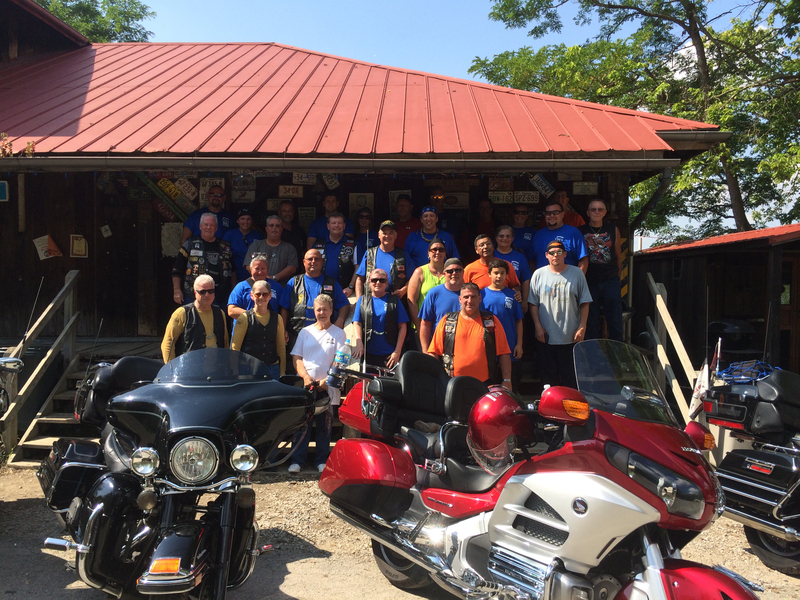 Azusa StreetRiders from 12 US states and Canada converged on First Apostolic Church (Pastor Kenneth Carpenter) in Maryville, TN for our only true annual “fellowship” event…All other events worldwide focus on outreach for Christ. We had rides (Google “Tail of the Dragon”) and events scheduled for each day and had 42 bikes on one “Dragon” ride! We were blessed to have Pastor Cortt & Sis. Amanda Chavis (Truth Chapel, Loganville, GA) as our featured speakers for our three open-to-public night services. Attendance estimates were around 300-400 for each night and we were ministered to! Thank you Bro. & Sis. Chavis! These messages will soon be available for viewing on our ASR website…Listen to them…You will be blessed! 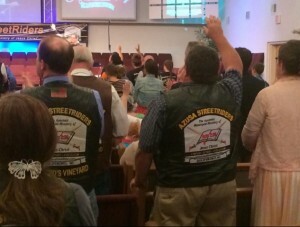 At our Azusa StreetRiders International business meeting Saturday, Bro. Robert Thompson (Maryville, TN Chapter) was re-elected Secretary and Rev. Todd Storey (Northern KY Chapter) was elected Vice-President. Two international appointments were also made…Rev. Julie McGhghy (Cincinnati, OH Chapter) was installed as ASR Ladies Chaplain and Bro. Michael Theodore (Ashtabula, OH Chapter) was installed as ASR Road Captain. Sis. McGhghy is available to assist with any issues specific to women and can be contacted via the ASR website, while Bro. Theodore will be assisting each chapter with their rides. Both have considerable experience for their respective positions and should be contacted as needed. For their efforts and help with Azusa StreetRiders, Bro. & Sis. Carpenter and Bro. & Sis. Chavis were inducted as “Honorary Members” of Azusa StreetRiders and were each presented with a vest with our ASR backpatch stating such. This past year our Azusa StreetRiders US and Canadian efforts resulted in funding for the purchase of two motorcycles for Brother Naimy (ALJC missionary to the Philippines) and a gift of $1,000 to ALJC’s World Missions Department. At the business meeting, it was stressed that the funding goal for each ASR chapter is $1,000 annually for “Motorcycles for Missionaries.” Additionally, to help promote our efforts for Christ, we asked each member of ASR that is active on social media to promote us. 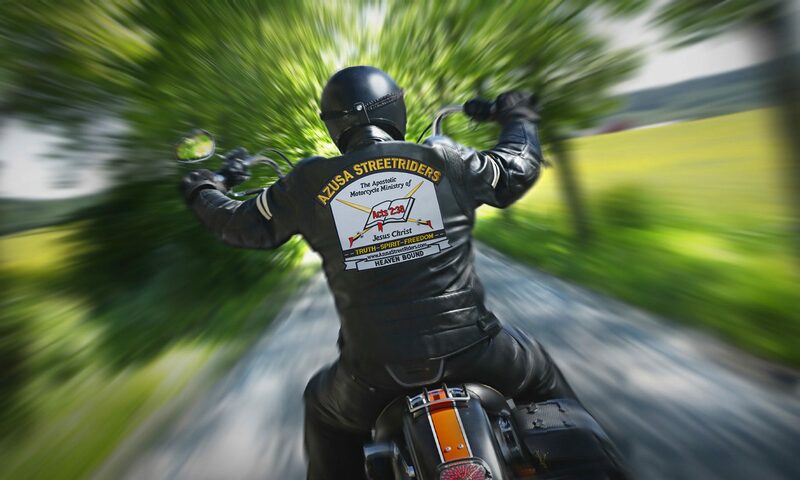 On Facebook, our official name is “Azusa Street-Riders” and on Twitter, we are “@Azusa StreetRide”…We were asked to please “Like”, “Share” and “Retweet” info about our upcoming events that are promoted there and ask other to also “like” and “follow” us. It was announced that the next “Bind the Strongman” all-night prayer event will be held at United Pentecostal Church (Pastor Robert Eades and ASR Member) in Eminence, KY on March 6, 2015. Prayer will start at 9:00 PM. This is Azusa StreetRiders’ annual prayer event that does not involve biking…everybody (public welcome) comes together and prays through the night following World Network of Prayer’s guidelines. Focused prayer is led throughout the night and following the prayer, everyone simply returns home. We’ve had attendees from as many as nine states attend a past event…Needs are met and prayers are answered at these events. Please plan to attend! The day started with our annual bike show. This year we changed things up and had the bike show first, right in the middle of town! We had a good response, but with the threat of storms all day it keep our offical regastration to 38 bikes, however 50 acually participated. Many people stopped in to see the motorcycles or make donations from 9:30 till around 1:00 pm. We estimate that between 175 and 200 people came through either to look or sign up for the bike show. Others just came to ride to Rabbit Hash, KY with us. Rabbit Hash is just a little over 70 miles from Eminence. It is a local biker hang out. All but two visitors had never attended before, so we were able to witness and tell many more about Jesus and the ASR. The Lord was kind to us and kept the storms away ‘till all had returned home or to local hotels. 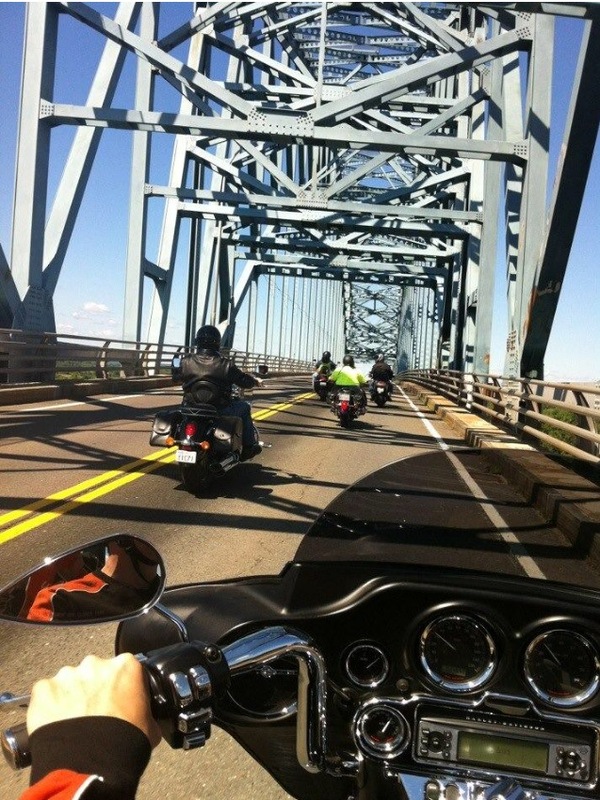 We had an awesome ride to Rabit Hash through five counties and some hills, but most of the ride was along the Ohio River. Throughout the day, we had many opportunities to witness to people and had a new member sign up for ASR in the Northern KY Chapter. Thank you Jesus! All in all it was a sucsessfull day. We raised $570.00 dollars for the KY Wounded Warrior Project and so far we have raised $380.00 for ASR’s Motorcycles for Missionaries.We are trusting the Lord for the ability to raise the remanding $620.00 to achieve our $1,000.00 Chapter goal. We would like to thank all who were able to join us this year and all that covered us in prayer! We love y’all and this wonderful ministry! All the members of the Northern Kentucky Chapter send their thanks for your support. May God Bless each and everyone of you for all that you do for His kingdom! Events for Cruzin’ for Christ were centered at Abundant Life United Pentecostal Church in Sussex, New Brunswick. Our 2014 goal was to raise enough funds to purchase three more motorcycles for use in Ghana, West Africa (Bro. and Sis.Nick Sisco and Sis. Colleen Carter). Our “Cruzin’ for Christ” organizing committee is comprised mostly of members of the Atlantic Canada Chapter of Azusa StreetRiders. The committee meets regularly on an almost year-round basis. Biker Registration area is set up in the foyer of ALUPC. Appropriate signage is present and maps and directions are available for out-of-town bikers who have made reservations at one of the area’s motels or Bed & Breakfasts. Accommodation information is available on the “Cruzin’ for Christ” website. (www.cruzinforchrist.ca). As bikers register, the funds that they have gathered are recorded on their Ride Application /Pledge Sheet and Waivers are signed. This year’s concert had a “House Band” plus nine different “performers” (if that’s the appropriate word to use in this context) in concert. We had a canteen and the first $200.00 of canteen profit is designated as a gift to the “MK” program of the UPCI. This money is used to purchase bicycles for “Missionary Kids” somewhere on the foreign field. For 2014, although a final audit has not occurred as of this date, we anticipate being able to send approx. $240.00 to the MK program. The free-will offering received during the concert totaled about $450.00. About 100 people were in attendance. Visitors get a first-hand view of old fashioned Pentecostal worship, prayer and praise! The result was one young man filled and another re-filled with the Holy Ghost and one was baptized in Jesus’ name! (Both young men were again in church for the Sunday Evening service and both were again at the alter and praising, praying and worshiping.) For the event, we raised enough to buy four motorcycles and two bicycles for MKs. To God be the Glory! Registration for the bikers started at 7:45 am. Breakfast was at 8:30 am and “Kickstands Up” was at 9:30 am. It’s the policy of the “Cruzin’ for Christ” Ride to plan the Biker’s Route in such a way that the ride stops for a “Noon Meal” visit with a smaller congregation that would ordinarily not have a chance to host any events within the Atlantic District. This year we stopped at the Blackville United Pentecostal Church in the village of Blackville, New Brunswick. Bro. and Sis. John Beach have seen attendance double in the 24 months they have pastored there and they are now seeing about 70 saints per service. This is in an area that has been devastated by a lack of employment. They organized a “Biker BBQ” for this noon meal. We learned that the church made new contacts within their community and had new people in their Sunday Service as a result of the BBQ. We were able to supply Bro. Beach with the “Outreach” type tracts that are available for download from the Azusa StreetRiders website. He also used these for the bikers that stopped in to see why so many motorcycles were parked in the church yard! 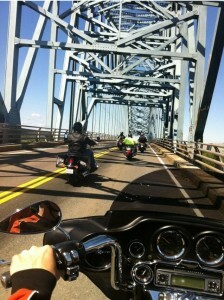 The Bikers then made their way back to Sussex where we arrived in time for a 5:00 pm Roast Beef Dinner. A number of events/rides are planned for the 2014 “riding season” by local Azusa StreetRiders’ chapters across the country. Go to https://www.azusastreetriders.com/event/ to see a few and join with us to reach out to lost bikers and their families. If you’re a Oneness Apostolic biker, don’t overlook these potentially soul-saving outreach opportunities. Plug in! Get involved! Help us win souls! Do you need a true miracle from God? ASR’s second annual “Bind the Strong Man” Prayer Gathering is when and where it can happen! Last year it was held in Myrtle Beach, SC, and at least one lifesaving miracle took place, along with some instant healings and other spiritually powerful occurrences. My oldest son, Patrick, was healed of brain cancer! Despite the doctors saying he’d only live 18 months if he did everything they told him to do (which he didn’t), he walked away from Bind the Strong Man saying “I’m healed!” Over the next four months, the cancer continued to grow and new places appeared in his brain MRIs. Yet Patrick continued to have faith, and he would tell the doctors that he “had cancer but God healed” him. They wanted to start radiation on one of the new spots one month, and the next visit, they wanted to do an immediate biopsy on another new spot. Those didn’t happen! Patrick’s refusal to succumb to their insistence on man’s treatments and his continued witnessing to everyone he saw about his “healing,” resulted in a “cancer-free” MRI—to the doctors’ amazement—in the fourth month after Bind the Strong Man. His last MRI was in January (a year after surgery) and the head of the neurological oncology department at the University of South Carolina said, “I want the faith that you have!” God is Good! Bind the Strong Man is the brainchild of ASR Member, Bro. Mike Markham, Pastor of Turning Point Fellowship, 95 County Road 755, Marbury, AL 36051, where this year’s event is to take place. Bro. Markham is a gruff US Marine with a teddy bear’s heart for souls! He uses motorcycles to help build churches and God is moving through his efforts. 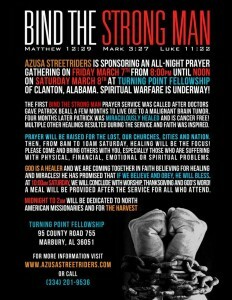 Bind the Strong Man is open to the public but is an ASR event. ASR members sacrifice their time and expenses to attend this event solely for prayer. Last year in Myrtle Beach, ASR members from about ten states attended from as far away as Forsyth, MO (the Cobbs) and one member even flew in (Sis. McGhghy) from OH. Unlike most ASR events, there will not be a ride as our focus is on prayer. We simply get together to have “focused” corporate prayer and then return to our homes. Prayers will be focused throughout the night and different facilitators will introduce us to the next corporate-prayer topic. We’ll pray for the local church, the city, the state, our nation and the state of mankind. We’ll pray for godly leadership of all officials. We’ll plead for a revelation of truth to the Christian community and for the opening of understanding of the necessity of baptism in Jesus name and the infilling of the Holy Ghost. Of course, we’ll pray for the outreach efforts of Azusa StreetRiders along with the efforts of the churches we attend and missionaries we support. Most of all, we’ll pray for God’s will to be done everywhere! We’ll take short, non-conversational coffee and snack breaks as individually needed throughout the evening in order to keep our knees from cramping and our strength up. 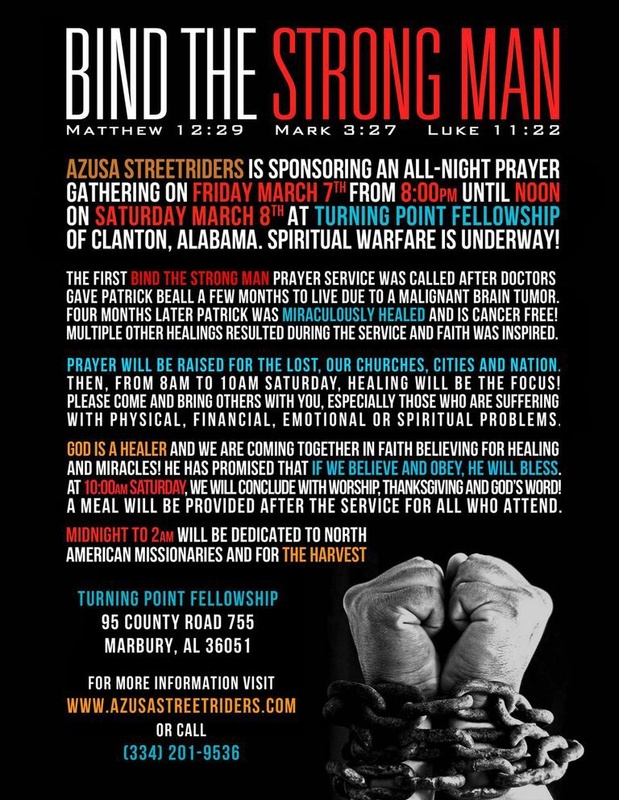 Bind the Strong Man will last from 8:00 PM on Friday, March 7 until Noon on Saturday, March 8. This should give most of us time to return home to our local churches. For those ASR members who are able to stay, there will be a time of fellowship! Please make every effort to attend… blessings are in the sacrifice. Please also put attendance to this event into your prayers and fasting (Sis. McGhghy is organizing with our Chaplain, Bro. Curley) and let’s see where God takes us this year!